An important first note is that the recipients of this new pool of money will not be the poorest students at Harvard; even before this donation, Harvard already guaranteed full scholarships to any family making under $65,000 per year, and that families making up to $150,000 would not have to pay more than ten percent of their income. Consequently, these additional scholarships would be going towards students from families who are already safely in the middle class. A correction attached to Kim's article notes that Griffin's donation will support existing guarantees of aid for students from families making \(\leq\)$65k/yr, but really, that just means that the University will divert the existing support elsewhere, and it washes to the same thing. Her point that there are were no poor students made able to attend Harvard because of Griffin's gift was made. Maybe this isn't convincing to you if you don't but the consequentialist argument-stack, but this is not a post on metaethics. But, like, I do think that lower tuitions are almost never a bad thing, and I think that bashing Stanford too hard for doing some small measure of good is neither actually-good nor fun. It is true that [$5k tuition for \(\leq\)$125k families] is better than [full tuition for everyone] or even [$13k tuition for everyone]. [O]ne day a rookie U.S. consular official had student after student come before him [with visa applications] with the same line that some chat room had suggested would work for getting a visa: "I want to go to America to become a famous professor." After hearing this all day, the U.S. official was suddenly surprised to get one student who came before him and pronounced, "My mother has an artificial limb and I want to go to America to learn how to build a better artificial limb for her." The official was so relieved to hear a new line that he told the young man, "You know, this is the best story I've heard all day. I really salute you. I'm going to give you a visa." You guessed it. You guessed it. The next day, a bunch of students showed up at the embassy saying they wanted a visa to go to America to learn how to build better artificial limbs for their mothers. One Gordon McKay donates a fortune to "take some poor little waif and educate them", and the School of Engineering and Applied Sciences is founded. A hundred years later, one Ken Griffin donates a hundred million dollars, and middle-class students pay less in tuition. These things are not the same. Yale made a little bit of noise last year in protest of the a-few-thousand-dollars student contribution that gave otherwise full-aid students the choice between working ~12 hours a week or picking up some tens of thousands of dollars of loans. Students wanted to see full-aid mean full-aid, and y'know, if the FinAid office had the funds to spare, I think they've got a point. Ceteris paribus, I'd prefer to be at an institution where class differences didn't mandate whether you had to pick up a job in addition to your studies. And if Stanford had a chance to take a step toward that sort of learning environment, and chose instead to send the funds to middle-class households...eh, they probably could have made a better choice. : Tuition approximation, based on my playing around with Stanford's own price estimator, filling in reasonable-feeling values for a sample 2-parent, 2-child $125k-income family paying $16k in taxes and with $200k assets in savings. Take with three or more grains of salt. 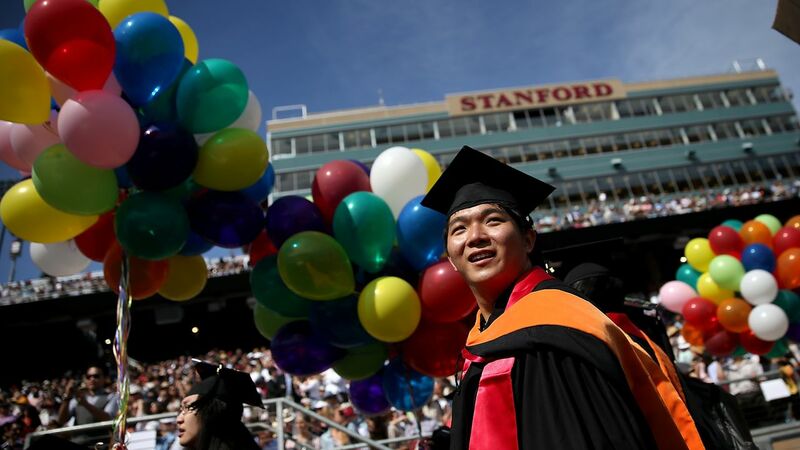 : Stanford, like every other school I've heard of, maxes out its aid packages at a level that still requires some "student contribution", assumed to come from term-time or summer jobs or student loans.